Make sure those niggles don’t become problems. Book 3 treatments before the half marathon on Sept 23rd, & receive ONE FOR FREE. 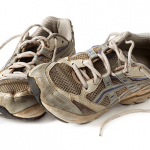 Here’s hoping your trainers look slightly better than these ones…….